New for 2010 is the Frosty Fun Decade series! Featuring a new snowman each year with "snowy" numbers depicting the year. 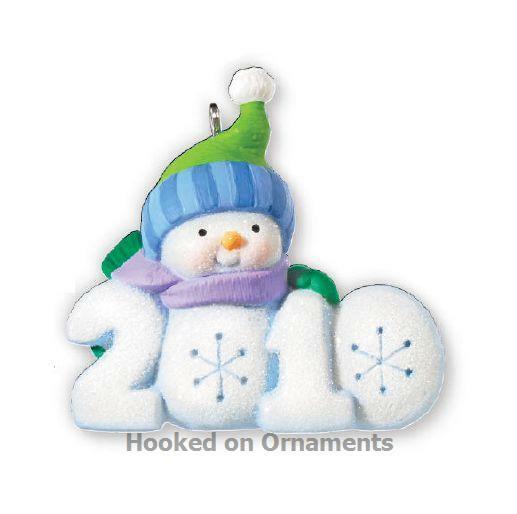 Look forward to ten years of fun with this frosty new ornament series. A different snowman will arrive each year to help commemorate the season. Another year in which I missed getting one of the ten Decade ornaments in a series, and it happened to be the first one! (Sometimes I just can't get to the Hallmark stores in time.) I am very happy that this year was still available through your company. It is so cute, and it is nice to have the complete series. I am more vigilant now, so I think I will be able to complete the current Decade series with the 2018 and 2019 ornaments when they come out for their respective Christmas'. Since I got the repainy, I had to have the "REAL" first in the series. I am a snowperson person, so it was a must have. I think the piece is very cute.